Rosh HaShanah (ראש השנה) is the Jewish New Year. It falls once a year during the month of Tishrei and occurs ten days before Yom Kippur. Together, Rosh HaShanah and Yom Kippur are known as the Yamim Nora’im, which means the Days of Awe in Hebrew. In English they are often referred to as the High Holy Days. Rosh HaShanah literally means “Head of the Year” in Hebrew. It falls in the month of Tishrei, which is the seventh month on the Hebrew calendar. The reason for this is because the Hebrew calendar begins with the month of Nissan (when it’s believed the Jews were freed from slavery in Egypt) but the month of Tishrei is believed to be the month in which God created the world. Hence, another way to think about Rosh HaShanah is as the birthday of the world. Rosh HaShanah is observed on the first two days of Tishrei. Jewish tradition teaches that during the High Holy Days God decides who will live and who will die during the coming year. As a result, during Rosh HaShanah and Yom Kippur (and in the days leading up to them) Jews embark upon the serious task of examining their lives and repenting for any wrongs they have committed during the previous year. This process of repentance is called teshuvah. Jews are encouraged to make amends with anyone they have wronged and to make plans for improving during the coming year. In this way, Rosh HaShanah is all about making peace in the community and striving to be a better person. Even though the theme of Rosh HaShanah is life and death, it is a holiday filled with hope for the New Year. Jews believe that God is compassionate and just, and that God will accept their prayers for forgiveness. 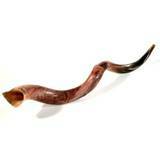 The shofar is an important symbol of Rosh HaShanah. It is an instrument often made of a ram’s horn and is blown one hundred times during each of the two days of Rosh HaShanah. The sound of the shofar blast reminds people of the importance of reflection during this important holiday. Learn more about the shofar in this article. Tashlich is a ceremony that usually takes place during the first day of Rosh HaShanah. “Tashlich” literally means “casting off” and involves symbolically casting off the sins of the previous year by tossing pieces of bread or another food into a body of flowing water. Learn more about tashlich in this article. Other significant symbols of Rosh HaShanah include apples, honey and round loaves of challah. Apple slices dipped in honey represent our hope for a sweet new year and are traditionally accompanied by a short prayer before eating that goes: “May it by Thy will, O Lord, Our God, to grant us a year that is good and sweet.” Challah, which is usually baked into braids, is shaped into round loaves of bread on Rosh HaShanah. The circular shape symbolizes the continuation of life. On the second night of Rosh HaShanah it is customary to eat a fruit that is new to us for the season, saying the shehechiyanu blessing as we eat it to thank God for bringing us to this season. Pomegranates are a popular choice because Israel is often praised for its pomegranates and because, according to legend, pomegranates contain 613 seeds – one for each of the 613 mitzvot. Another reason for eating pomegranates on Rosh HaShanah has to do with the symbolic hope that our good deeds in the coming year will be as many as the seeds of the fruit.